McKayle, Camille and Stolz, Robert, Interdisciplinary Curricular Innovations at the University of the Virgin Islands, Contributed Paper Session in Mathematical Biology, Joint Mathematics Meetings, San Francisco, January, 2010. Mihelcic, J.R. “Educating Tomorrow’s Global Engineer through a Unique Partnership with the U.S. Peace Corps,” Woman Engineer, 30-33, Fall, 2004. Mihelcic, J.R., “The Right Thing to Do: Graduate Education and Research in a Global and Human Context,” in What Is Global Engineering Education For? The Making of International and Global Engineering Educators (Eds: G.L. Downey and K. Beddoes), Morgan & Claypool Publishers, San Francisco, pg 235-250, 2010. Mihelcic, J.R. and D.R. 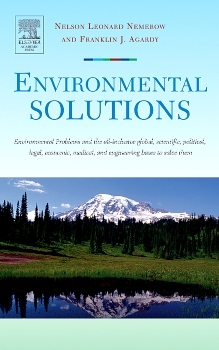 Hokanson, “Educational Solutions: For a more Sustainable Future,” in Environmental Solutions, Eds: N.L. Nemerow and F.J. Agardy, Elsevier, pg. 25-58, 2005. Mihelcic, J.R., E.A. Myre, L.M. Fry, L.D. Phillips, B.D. Barkdoll. Field Guide in Environmental Engineering for Development Workers: Water, Sanitation, Indoor Air, American Society of Civil Engineers (ASCE) Press, Reston, VA, 2009. Mihelcic, J.R. Fundamentals of Environmental Engineering, 335 pages, John Wiley & Sons, Inc. New York, 1999. Mihelcic, J.R. Fundamentos de Ingenieria Ambiental, 384 pages, Limusa Wiley, Balderas, Mexico, 2001.